History/Mythology: Morganite is a relatively recent discovery and was named after the man that discovered it – John Pierpoint Morgan. 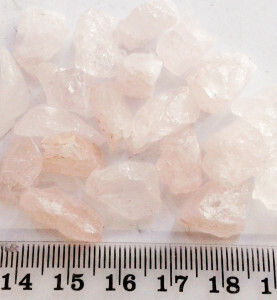 It is a member of the beryl family and gets it unusual pink colour from impurities such as Manganses. Morganite is a very high vibrational stone that resonates a strong vibration of unconditional love. By its affiliation to the heart chakra Morganite helps us to connect with Divine love of all things. It helps in healing all issues of the heart including spiritual, physical and emotional as well as cleansing the heart chakra. Morganite has a calming effect and will help us to see the joy and beauty around us by opening up the heart and allowing us to let go of old hurts and move forward. Morganites high vibration allows us to strengthen the bond between us and higher vibrational beings in order for us to find joy, peace and love in life. Healing – Assist with Emphysema, Lung cancer and asthma, Thyroid issues and any nervous system dysfunctions. Morganite should be worn for a long periods of time in direct contact with the body in order to let go of old hurts and move forward in areas of the heart. Can be used in all meditations for its high vibration, conection to higher beings and opening up the heart Chakra. A stone circle of Morganite stones is a great enhancing method and make is much more powerful. Placing a stone over the heart during healing.